Ernst Schliephake was born May 23, 1962. After beginning violin lessons at the age of five, at just seven years old he already won his first competition. In 1973 he started playing the clarinet as his second instrument. Schliephake studied violin at Music Academy Detmold from 1979 to 1985 and served as the assistant to his professor Mr. Lukas David from 1983 to 1985. It was during this time that he also played the clarinet in concert with violinist Tibor Varga, performing the Brahms Clarinet Quintet 14 times. In 1981 Schliephake played in a master class for Ruggiero Ricci, beginning a long friendship and collaboration that continued up to his passing on August 5th, 2012. 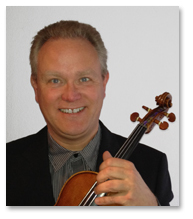 Schliephake has served as a violinist in the Düsseldorf Symphony Orchestra, the Bavarian Radio Symphony Orchestra, the Bavarian State Opera Orchestra and since 1989 has been the associate concertmaster of the Munich Symphony Orchestra. He has also edited numerous works for G. Henle Verlag. Below you will find the complete list of scores edited by Ernst Schliephake for Ovation Press.